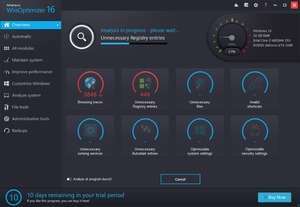 Ashampoo WinOptimizer is an application designed to help users maintain, optimize and cleanup their system more easily without having to use multiple third party programs. The interface of the software provides an organized layout in which all the tools and features are easily accessible. All the tools are organized in several categories depending on the type of operation that can be performed with them and on which Windows component they will be applied on. Some of the main tools available are: a hard disk defragmenter, a drive cleaner, a registry optimizer, a startup manager, a Internet trace cleaner, a service manager, an uninstall manager, a process manager and many more as well as a large list of Windows tweaks which can be used to modify the system 's components behavior in various situations. Ashampoo WinOptimizer has a presence on social networks.